Arby’s, founded in 1964, is the first nationally franchised sandwich restaurant brand with nearly 3,400 restaurants worldwide. The Arby’s brand purpose is to “inspire smiles through delicious experiences.” Arby’s delivers on its purpose by celebrating the art of Meatcraft with a variety of high quality proteins and innovative, craveable sides, such as Curly Fries and Jamocha shakes. Arby’s Fast Craft restaurant services feature a unique blend of quick serve speed combined with the quality and made for you care of fast casual. Arby’s Restaurant Group, Inc. is the franchisor of the Arby’s Brand and is headquartered in Atlanta, Ga. Pastry and Filling: Peel, core and slice apples. In medium saucepan over low heat, cook apples with sugar, cornstarch, lemon juice and cinnamon, stirring frequently, until apples are tender. Refrigerate until cool. 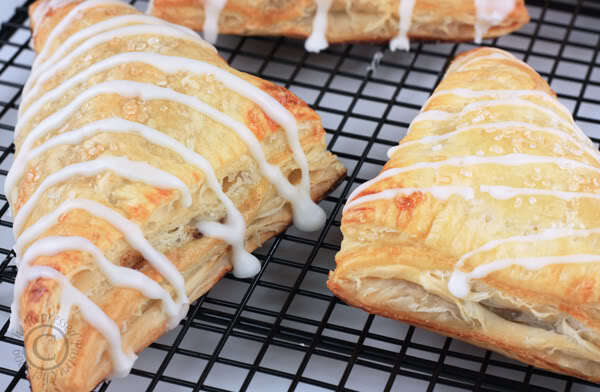 Thaw pastry sheets at room temperature 20 minutes. Preheat oven to 400 degrees F. Unfold pastry on lightly floured surface. Roll each sheet into a 12-inch square and cut into four 6-inch squares. Place 1/4 cup apple mixture in center of each square. Brush edges with water. Fold to form triangles, seal edges firmly with a fork. Place on 2 baking sheets. Bake 25 minutes or until golden. Cool on wire rack. Sugar drizzle: In small bowl, mix together confectioners sugar and water. 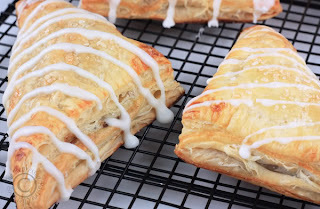 With spoon, drizzle on turnover, allow to set before serving. Copycat Recipes from the menu at Arbys Restaurants.